Please contact us to learn about an upcoming offering of this course in near future. Dhanvantari Day set an auspicious note for the inauguration of Vaidya Ramakant Mishra‟s training course in the Vibrational Medicine of Ayurveda. On Dhanvantri day India celebrates the archetype of the enlightened healer in the figure of Shri Dhanvantri. Shri Dhanvantri is commemorated for having given the Gods the prized elixir of immortality, and made the knowledge of health and longevity available to humans. On that day, Ayurvedic practitioners, therapists, and students of Ayurveda gathered at the Arsha Vidya Gurukulam in PA to be initiated into the vibrational healing techniques passed down through Vaidya Mishra‟s family for countless generations. This was the first time this knowledge was being transmitted to anyone outside the family. The course participants were honored to be initiated into this tradition and given the responsibility to use this subtle yet powerful technology wisely. As Ayurveda gains recognition globally, it seems to be adopting a pill-popping approach to health that mainstream healing institutions promote. The course was a first step towards taking Ayurveda beyond this mechanistic approach, back into its roots, into the subtle vibrational dimension. 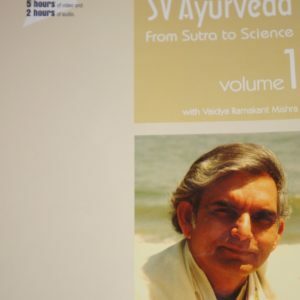 Calling upon his family‟s rich healing tradition, Vaidya Mishra delved into the intricacies of the vibrational levels of Ayurveda, drawing parallels with the findings of quantum physics, and relating the importance of the “light of the soul” as the primary vantage point of the ayurvedic physician/healer. Utilizing the vibrational energies and physical realities of Soma, Agni, and Marut as described in the ancient texts of the Shiva Swarodaya, Vaidya Mishra elaborated upon the “new” vibrational modalities of Ayurveda. In contemporary scientific terms, course participants learned how to make use of “frequency specific energy” tools, mantras, vibrating on specific frequencies, in order to “read” imbalances and correct them on those same subtle vibrational levels. Vaidya‟s Vibrational Medicine of Ayurveda approach provides and teaches the means to enhance the reception and flow of Prana (“the breath of life”), as well as Soma through many modalities. It focuses on redirecting our awareness unto our actions, and the impact we have on the environment through our actions; it teaches us to be aware of and to heed the consumption of foods that are vibrationally supportive; explains the importance of using pure untreated unadulterated water; the adoption of a balanced daily routine that attunes the physiology with the vibrations of the flow of seasonal and daily time shifts. Vaidya also described other “vibrational tools” such as the use of the Transdermal Marma creams, “Herbal Nectars,” floral mists or sprays with herbal essences, the importance of listening to and chanting vibrationally “pure” sounds, such as the “Heart Lotus” mantra. He also highlighted the importance of meditating daily, at least once, in order to reduce the ojas-depleting effects of stress. The course had a complete approach consisting of theoretical knowledge, healing sound techniques and vibrational formulas, as well as more practical tips including the use of herbs and creams, thus raising the standards of ayurvedic care to new heights of refined effectiveness. The 50 course participants experienced firsthand the immediate results of this paradigm shift of Ayurveda. The results were nothing short of awe-inspiring as changes in nadis, pulse, emotions and mind were instantaneously experienced. The in-depth explanations of each element of this technology were taken directly from the ancient vedic texts, presented clearly in powerpoints, with both the Sanskrit and the transliteration for ease of pronunciation, followed by word for word analysis of each sutra. The role of Aditattwa, the ultimate primordial source energy that regulates all the mahabhutas, or elements, that underlie the physiology was highlighted as course participants learned how to use Vaidya‟s ayurvedic techniques and tools to stay rhythmically connected to the source. Jyotishi Blaine Watson inspired the group with his lecture on the role of vedic astrology in aligning oneself with the vibrations of space-time geometry and the cosmos. Melina Takvorian (PhD) presented a scientific look at the field of Vibrational Medicine as it is being practiced today, drawing lines of concurrence with Vaidya ayurvedic approach. Architect, published author, and Vastu consultant Michael Maestro explained the use of Vastu in home design, and the importance of aligning the body and building the grid system, allowing the home dweller to take advantage of reflected solar, lunar, stellar and magnetic energies, thus strengthening one‟s life.